Premiere Executive Office Space, Virtual Offices & Conference Facilities in the Heart of Weston, FL. 954.217.6681. New Website Showcases Premiere Office Space, Virtual Offices & Conference Facilities in the heart of Weston, FL. 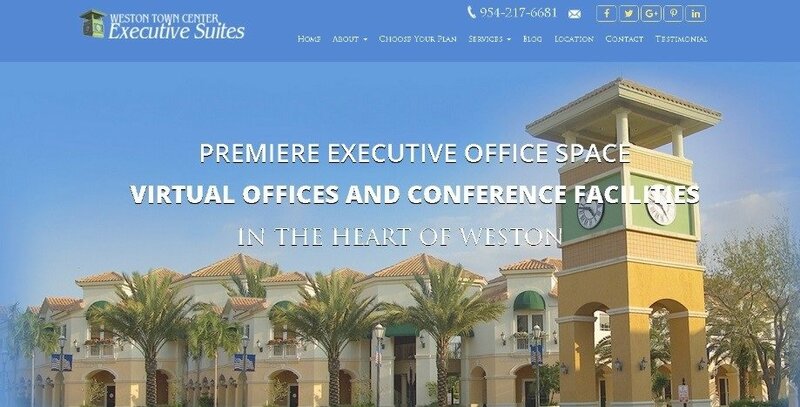 After many months of planning, Weston Town Center Executive Suites is delighted to announce the launch of the new version of our website. The fresh look and up-to-date images better reflect our premiere Executive Office Space, Virtual Offices and Conference Facilities in the heart of Weston, FL. Our main goal is for visitors and prospective office and meeting room clients to be able to get a feel for what it will be like to utilize workspace at Weston Town Center Executive Suites. We want to provide the useful information needed when considering options for choosing executive office space. In addition, we would like that information to be easy to find and to provide visitors an insight into the services we offer. We are also excited about our smart booking features for our Virtual Offices. We want to help entrepreneurs, small businesses and start-ups understand the value and benefits of a Virtual Office in Weston and to help them easily find the plan for their particular needs. We are proud to offer 5 different Virtual Office plans ranging from Business Identity Packages to a Part Time Office Plan. Now clients can easily understand what each Virtual Office Plan offers and they can save time by buying a Virtual Office Plan online. The website also offers updated client testimonials, blog posts, tips on choosing the perfect location for your business and choosing the right service plan. We hope you like our new website…we certainly do. Please call us to schedule a tour at 954-217-6681 or fill out a contact form for more information.